What is the difference between Mobile BYOD VoIP, Virtual Extensions and Mobile Apps for business phone solutions? How can a business reduce phone costs while leveraging mobile capabilities? Can a business just go completely mobile and avoid the cost of buying desktop Phones for everyone? These are just some of the questions that we are often asked relating to how hosted VoIP solutions for businesses can integrate with mobile devices. Comscore recently released a report stating that as of October 2013, 149.2 million people in the United States owned a smartphone. This is up 4.1% from July 2013 and this growth is expected to continue. As such it seems like a fair assumption that the majority of people that require a business phone line at work, will also be carrying a smartphone in their pocket. While this creates some opportunities for businesses to take advantage of Smartphone use, it also raises a number of questions. 1) What does BYOD mean with respect to office phone services? BYOD stands for Bring Your Own Device and is a common term in the world of technology where a consumer (or business) will use their own device (equipment) instead of buying or leasing the device from the company providing the service. A good example of this is when people want to use their own telephone adapter when signing up for residential VoIP service. What we are referring to here though is having a smartphone owner allow their phone (the device) to be integrated with the corporate phone system, and then use this personal smartphone for business use. This has been happening for a number of years to allow employees to check emails when out of the office, however it is only recently that these devices are being integrated with the businesses telephone system. Some companies even allow personal laptops to be connected to the corporate network as a BYOD device. For the purposes of this discussion, we are only going to focus on the voice application related to mobile devices and will not go into any detail on other BYOD applications such as email. Business phone service providers are certainly guilty of using the BYOD term to their liking and we have seen it used when referring to not only mobile devices, but also IP desk phones and other equipment. For example if your company decides to switch from one phone service provider to another, and you have already purchased a number of IP phones, you will not want to have to buy phones all over again. In this case, the IP phones are the BYOD devices. Are you confused yet? It really just comes down to the context in which the terminology is being used. Just remember that for this discussion we are talking about smartphones as the devices and business voice calls and features as the service. 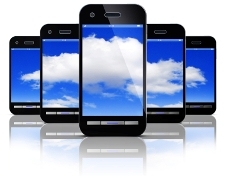 There are significant benefits with mobile BYOD (i.e. smartphones) as it enables a subset of enterprise level telephony features to be made available on a smartphone device. The smartphone effectively replicates the functionality of a desktop office phone. 2) What is a virtual extension and is it the same thing as BYOD? The business line used for this can either be a stand-alone line or be tied to a permanent desk phone. One use of a virtual extension is to simply use the extension for inbound calls that redirect to an answering service. Along the same lines, a virtual extension can be simply set to go straight to voicemail. So no physical device is associated with the virtual number. This is effectively a call forwarding service that provides an additional number. We have included this feature in this list as it can often be confused with mobile features but in effect it is just a virtual number that can be forwarded to a mobile number. 3) Will mobile BYOD cost the employee anything for making calls? This depends on what type of mobile app you are using with your phone service. Some apps will allow you to route calls via WiFi or use the cellular data network, while others will use your cell minutes. In most cases, the company will pay for your cell phone service or at least allow you to expense business calls. The catch here for the business is that costs can quickly get out of control due to the relatively high cost of cellular minutes. Group or pooled minute plans are good options for a business that decides to allow this type of expense. Using WiFi or the cellular data network for voice calls is the best option though. 4) Why bother with mobile BYOD in the first place? A business will save on the cost of buying an IP based desk phone for every employee. In addition, employee productivity is increased by having 24x7 access to their business phone line and all the features that come with it. If a business already provides cell-phones to some employees, this type of service can present a much more professional image to callers as features such as auto-attendants can be setup to streamline communications. Keeping the majority of voice calls off of the corporate network can also help avoid potential network issues with bandwidth and voice/data traffic prioritization. Employees may ask what is in it for them if they have to use their own phones. There are a few ways to incentivize them if necessary such as paying a portion of their bill, contributing to the cost of the phone, or just getting them a completely separate phone that is owned by the company. After all, think about how much the business will be saving not only on capital expenses (IP phones, networking equipment, cabling, etc) but also on operating expenses related to IT services and reduced bandwidth requirements. 5) Are there potential security issues with BYOD? Yes there are many security issues to be concerned about and most companies have strict policies and requirements that must be followed when integrating a mobile device into a corporate network. However, when it comes to voice apps that work with a hosted VoIP solution, there is little to be concerned about as everything is in the cloud and off of the corporate network. 6) What do hosted providers use mobile apps for? More and more hosted VoIP services offer a mobile app that is typically available for iOS (Apple devices) and Android based smartphones. Although some providers also have apps available for Blackberry and Windows based devices, they are nowhere near as common. These apps are typically an extension of an office phone and allow users to give the perception that they are in the office, as all calls to and from their business line will be routed to their mobile app. For example if the app is used for an outbound call, it will show the called party your business phone line as the caller ID. Likewise, for incoming calls, the mobile app will ring your smartphone or route the call to your business voicemail as opposed to your personal voicemail. Mobile app features can vary significantly depending on the hosted VoIP service that your company uses. 7) Can a business move to a fully BYOD solution and skip the desk phones altogether? While this is certainly an option and one that is becoming more and more popular, not many hosted providers offers this service in its entirety. You also need to consider that you will likely want to have a company number that is directed somewhere and you will also likely want to have a least one conference phone sitting on a desktop somewhere. Managers and executives typically participate in a lot of planned and ad-hoc conferences so this may also be an area where it makes sense to consider a desktop phone that has powerful conferencing capabilities. Regardless, having a fully mobile option for certain employees is likely a key requirement for a companies overall phone solution. 8) Why not just avoid using hosted voice-over-IP service altogether, and just use cell phones for business? Although this is definitely possible and no doubt a lot of small companies do this, it is not a recommended solution. By going this route, a business is sacrificing a lot of what could be considered business critical phone features. Some examples of these are automated attendants, directory lookups, extension dialing, call transfer and voicemail to email messaging. Employees are also likely going to want to keep their personal phone number separate from their business phone number. Check out our VoIP features guide for a comprehensive list of features that are often provided with a hosted service. 9) I'm still confused about the difference between BYOD, Virtual extensions and Mobile Apps? BYOD = Stand-alone service that uses your smartphone as your business phone. No desktop phone is used or required. Virtual Extension = A number that is routed to a device (e.g. cell phone) or service (e.g. voicemail). Mobile Apps = These are typically available for free to enable your smartphone to act similar to your office phone. 10) Can you summarize which type of mobile service is offered by popular VoIP providers? The different plans and features offered by different hosted VoIP service providers does indeed make this confusing when you start going through different websites, and trying to figure out exactly what they are offering. In the following article we will take a closer look at what is currently on offer and compare how each service differs. Unfortunately there is no clear cut, one size fits all solution and it really depends on the needs of each individual company. While it seems logical to stick with some form of hybrid solution that allows both in-office desktop phones and smartphone integrations that are not tied to a physical desk phone, some companies may want to cut the cord and go 100% mobile as soon as possible. If your company does move in that direction, we recommend making sure a hosted service is used to manage the calling and provide the basic features that we consider essential to maintain a professional company image. You should now have a good understanding of what these different terminologies mean and what type of services they are referring to. We actually got a bit confused ourselves while writing this due to the many ways in which these terms are freely, and sometimes incorrectly used by service providers. The challenge for you now is that you need to actually go take a look at what services these providers are offering and determine if that can help with your companies mobile expansion or transition. To help with this we have evaluated the mobile related products that some of the popular providers are offering, and what features they provide. Please visit our article on Why Mobile Calling Apps are now essential for every Business to continue reading and find out exactly how each provider compares and rates. The transition to a mobile world is accelerating. Don't let your business get left behind!